Feel like a hearty dish full of warm spices and oniony-gingery-garlicky goodness and the incredible flavors of sweet fall cauliflower and squash? Try this recipe! Disclaimer: I’m not a traditionalist when I cook. So this definitely isn’t a “traditional” Thai curry or Indian curry. I’m what I call more of a fusion cook, meaning I use whatever I feel like and whatever is around, playing with combos that taste great together. For this recipe, use whatever kind of winter squash you like (so far I’ve tried it with Red Kuri, Buttercup and Delicata, and all were wonderful). I’ll list some variations on the recipe at the end, too. Preheat oven to 350 degrees. Cut cauliflower into florets. Cut squash in halves or quarters (or thick slices). Trim up and de-seed peppers. Coat all of these in olive oil and put in roasting pans; I use one pan for the squash and one pan for the cauliflower and peppers. Bake until each are tender, and the cauliflower starts developing some nice browning (the squash will take a bit longer, so it’s nice to have that in the separate pan). When your veggies are almost done roasting, warm a few tablespoons of olive oil in a large skillet. Add the diced onion and cook for 5 minutes or so. Add in the garlic and ginger and cook for a few minutes more. Stir in all the spices and let cook for a minute or so. Add the salt and coconut milk and stir. Put your roasted mixed peppers in a blender or food processor with the tomatoes. Blend well and add the mixture to your skillet. Simmer everything for 5 minutes or so. While that’s simmering, remove the skins and seeds from your winter squash (if you didn’t do so before baking), and cut into chunks. 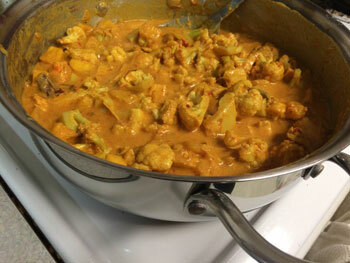 Add the roasted cauliflower florets and the winter squash chunks to the skillet and stir. Finally, add the yogurt and stir well, and remove from heat. Serve over warm rice. Roast a few Yukon Gold potatoes along with your winter squash, and cube those and add them, too. 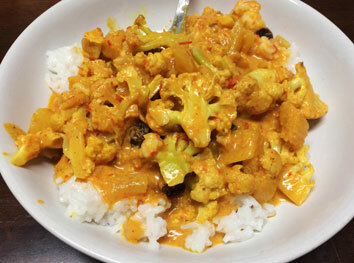 Add a half-cup of raisins when you stir in the cauliflower and squash. Add a handful of chopped spinach in the last few minutes of cooking. Top the dish with fresh chopped cilantro. If you don’t have any fresh tomatoes, just use something tomato-y, such as tomato paste, frozen roasted tomatoes, canned crushed tomatoes, or even salsa! Add some diced chicken to the dish. Add 1/2 teaspoon of cayenne pepper to spice it up more. In other words, have fun with this recipe! I bet it will be incredible no matter what.